The bulk modulus for air is tiny compared to that of water, since air is easily compressed and water nearly incompressible. 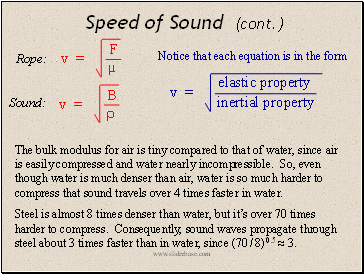 So, even though water is much denser than air, water is so much harder to compress that sound travels over 4 times faster in water. Steel is almost 8 times denser than water, but it’s over 70 times harder to compress. Consequently, sound waves propagate through steel about 3 times faster than in water, since (70 / 8) 0.5  3. 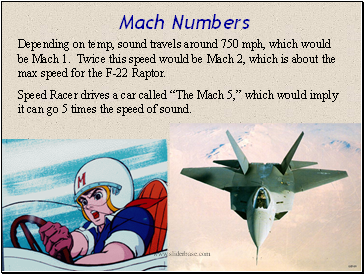 Depending on temp, sound travels around 750 mph, which would be Mach 1. Twice this speed would be Mach 2, which is about the max speed for the F-22 Raptor. Speed Racer drives a car called “The Mach 5,” which would imply it can go 5 times the speed of sound. 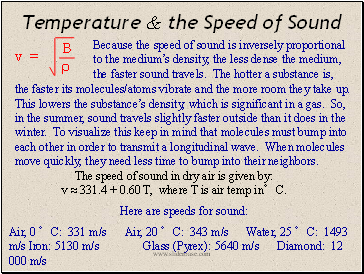 The speed of sound in dry air is given by: v  331.4 + 0.60 T, where T is air temp in°C. the faster its molecules/atoms vibrate and the more room they take up. This lowers the substance’s density, which is significant in a gas. So, in the summer, sound travels slightly faster outside than it does in the winter. To visualize this keep in mind that molecules must bump into each other in order to transmit a longitudinal wave. When molecules move quickly, they need less time to bump into their neighbors. 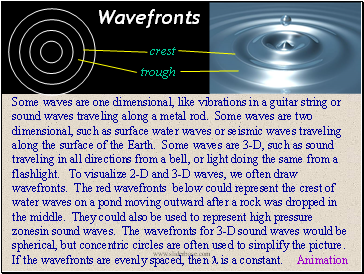 Some waves are one dimensional, like vibrations in a guitar string or sound waves traveling along a metal rod. Some waves are two dimensional, such as surface water waves or seismic waves traveling along the surface of the Earth. Some waves are 3-D, such as sound traveling in all directions from a bell, or light doing the same from a flashlight. To visualize 2-D and 3-D waves, we often draw wavefronts. The red wavefronts below could represent the crest of water waves on a pond moving outward after a rock was dropped in the middle. They could also be used to represent high pressure zonesin sound waves. The wavefronts for 3-D sound waves would be spherical, but concentric circles are often used to simplify the picture. If the wavefronts are evenly spaced, then  is a constant.